10 June 2005, 2:45 pm. 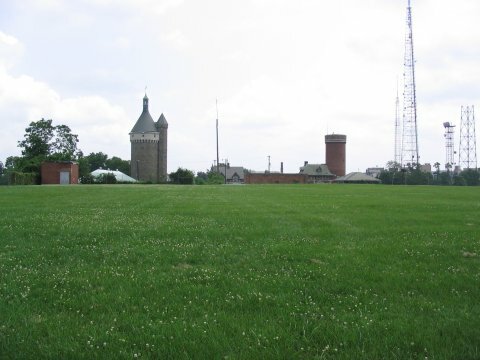 On 10 June 2005, I set out for Fort Reno from downtown Washington, DC. This area had been the site of Civil War conflict, hence the existence of the fort. I took the Metro Red Line, and got off at the Tenleytown-AU stop, exiting the subway station on the east side of Wisconsin Avenue. I then followed Wisconsin Ave north-northwest until it met Belt Road, then I walked along that road north-northeast until the intersection with Fessenden Street. 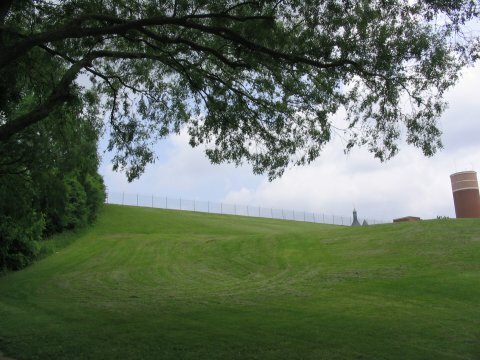 As I was walking north, the high ground was off to my right, to the east, surrounded by a fence. This fence confuses the issue of determining where the highest point lies, and also getting to it! The fenced area is generally separated into two pieces, a northern section (adjacent to Fessenden St), a southern section, with an access road (definitely lower in elevation) in between. 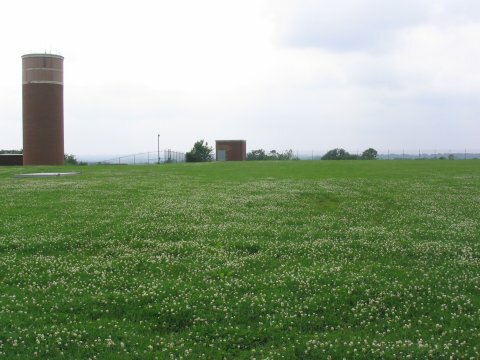 The southern section has a number of structures, including a cylindrical tower (which might have been part of the fort), while the northern section has no buildings on it. The highest point of the southern section was definitely higher than the fence line surrounding it that I could reach. However, the fence line around the northern section reached pretty much as high as any of the ground inside. This northern area was pretty flat, and any increase in elevation from the edge of the fence to the highest point was inconsequential, one or two feet at the most, and nothing that was really detectable to my eye. It seemed to my eye, as well, that the northern section was higher in elevation than the southern section. (It was definitely higher than the base of the buildings on the southern part.) My topo maps are ambiguous on this issue, but my judgment is that the northern section contains the high point. Since the elevation at the highest point just outside the fence was practically as high as the highest elevation inside, I am satisfied to count this highpoint as reached. 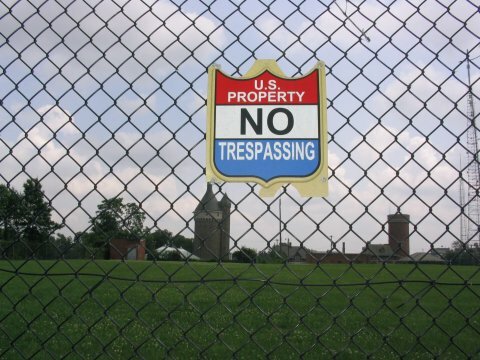 Looking at the northern section of the fenced off area, from just outside the fence. The difference in elevation (if any) between where I am standing and the highpoint inside seems inconsequential. You cannot go across the fence, sadly. It would be nicer, of course, to be able to walk inside the flat area to claim the summit with 100% certainty, but the difference really seemed trivial. I would, by the way, have to retract my claim of success if it turned out that the southern section held the highest elevation, since the fence line there was definitely lower than its highest elevation. I judged the highest point to be the corner of the fence closest to the intersection of Belt and Fessenden. The fence there, and the northern edge of the fence paralleling Fessenden (with some trees in between) were almost the same elevation, either of those could have been the actual high point. 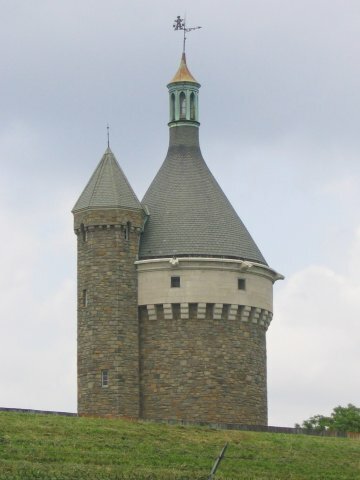 Fort Reno tower, in the southern section. Looking southeast from Belt and Fessenden. I thought the point on the fence at the left of this picture (next to the trees) was the highest point. Besides visiting Fort Reno, I made the usual tourist rounds while in Washington, DC. 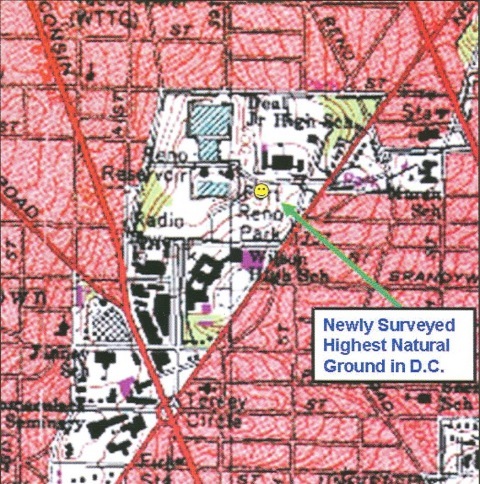 Update - Near the end of 2006, the Fort Reno area was surveyed to determine the highest natural point. The current highest ground is artificially formed. A temporary rebar marker has been placed, and an official marker is planned. The point seems to be just to the east of the southern section of the fenced-off area. Highpoint Adventures, Charlie and Diane Winger, Colorado Mountain Club Press, 2002.